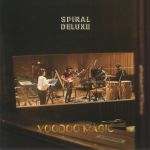 Review: Motor City techno legend Jeff Mills founded the American-Japanese tech-jazz/jazz-funk group Spiral Deluxe as a live outfit four years ago, but they've only just got round to recording a debut album. It's rather special, all told, with each of the four original tracks being laid down in one take at Faber Studios in Paris. Consequently, there's a pleasingly fluid feel throughout, with epic opener "E-MC2" - all virtuoso piano solos, freaky jazz-funk electric bass and bumpin' beats - arguably offering the best representation of their sound. You'll find some fine techno/jazz-funk fusion on the slap-bass-propelled title track, while "Let It Go", featuring the mesmerizing vocals of Tanya Michelle, sounds like an end-of-night classic in waiting. Mills old pal Terrence Parker gives his interpretation of that track on side four, re-imagining the delicate and poignant original version as an organ-heavy slab of gospel house brilliance.